There are quite a few mobile manufacturers which aim to bring in the affordable smartphone / smart tablet culture and out of those entities, one of them is iBerry. While Ubislate recently revolutionized the tablet market by launching the Akash tablets which got tremendous. In the latest, iBerry has come up with 2 new Android based tablets which are not only feature rich but also comes at an affordable price point. 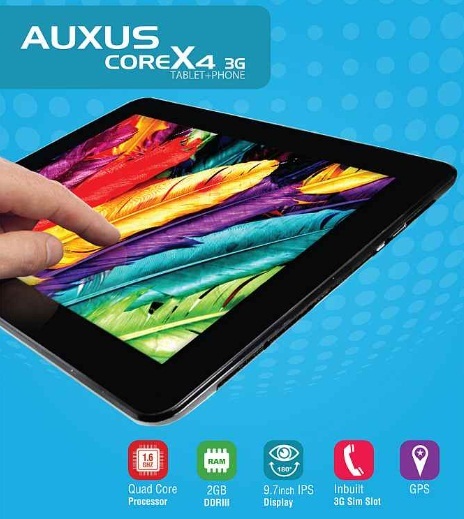 Adding to the portfolio of existing tablets which is Auxus AX01, Auxus AX03G and Auxus AX02. 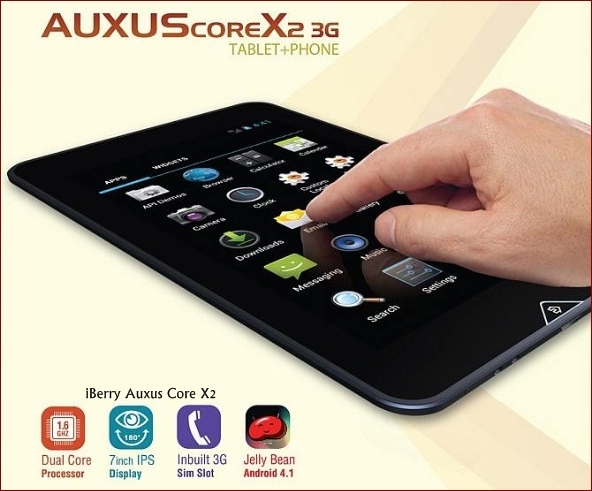 So, let’s proceed and check out on what are the detailed specs, features and review of Auxus Core X2 AND Auxus Core X4 3G smartphone. This tablet comes with 7 inched High Definition (HD) display which has a resolution of 1280 x 800 pixels which is powered by the dual core Cortex A9 processor which has a processing speed of 1.6GHz. If you talk of specs then this comes with the 1GB of RAM. This tablet comes with the 3G Sim card support, 2MP Rear Camera along with front facing VGA Camera and comes with the Jellybean 4.1.1 Android version. Adding to the specs, this one also comes with the 8GB of internal memory and an external SD Card support which can house a maximum of 64GB storage. If all the above specs weren’t enough, then this tablet comes with Latest Bluetooth 4.0, 4100Mah battery mettle and comes with a price tag of Rs. 10, 990. If one wasn’t enough, here’s one more tablet which comes with a bigger 9.7 inched HD IPS display along with a 1.6GHz Samsung’s EXYNOS Processor, 1.6GHz processor, 1024 x 764 resolution, 2MP Camera along with a front facing VGA camera. Tis tablet also comes along with the 16GB of inbuilt storage and an external micro SD Card slot which can house a maximum of 64GB of micro SD Card. If you talk of battery then this one comes along with the super huge 7200 Mah Battery. Last but not the least, this one comes with the ICS Android 4.0 firmware version out of the box. Do let us know just in case if you need any more info about both these tablets as we will be more than happy to let you know about the same in the comments section below. can i use samsung note 2 posts for jelly bean updation as well as rooting on Auxus Core X4 .m asking coz both are having same processor used…….plz reply. WITH VOICE CALL?WHAT ABOUT SERVICE CENTRE IN AHMEDABAD? yes you are right. RAM is 1 GB.But the processor is 1.6 quad core as per the company statement but i believe its 2 core as it’s china make. But overall the tablet is good, performing well. If you happened to know about rooting of corex 4,please let me know.